Park your car. Hop a train or bus. From virtually anywhere in Southern California, surface transportation will whisk you right to the downtown gates of the Grand Prix circuit with no gridlock worries. Getting There CAN Be Fun! 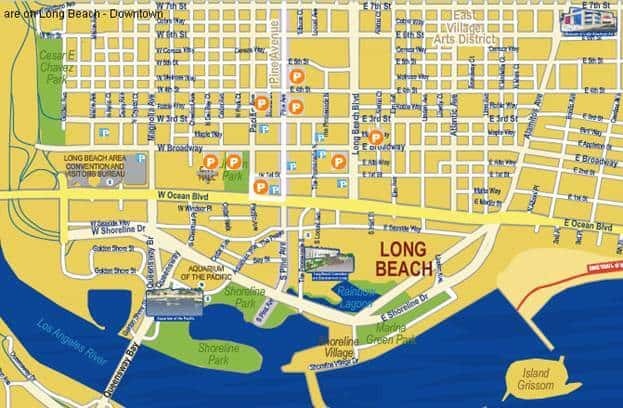 Getting around Long Beach – a great walk-around city – is easy using this simple-to-follow map. 5:00 AM Closure of the side streets off of Shoreline Drive and Seaside Way leading into the Race Course. 7:00 AM Closure of westbound Shoreline Drive, closure of the northbound Queensway Bridge off ramp, closure of the southbound Queensway Bridge on ramp from Shoreline Drive, closure of Aquarium Way south of Shoreline Drive. 3:00 PM Closure of eastbound Shoreline Drive from Broadway to Ocean Blvd. Pine Avenue will remain open to traffic for visitors to the Hyatt, waterfront restaurants, Shoreline Village, and Shoreline Marina tenants. Chestnut Place or Golden Shore Avenue will provide access to the Aquarium of the Pacific. Valet Parking will be available for guests dining at waterfront restaurants. Shoreline Village has parking available as well. All vehicles entering at Pine Avenue will exit to the east through the Marina Green parking lot, please follow the directional signage. 6:00 AM Access to the Hyatt, Shoreline Village, and the Shoreline Marina from Ocean Blvd. and Pine Avenue will close. Southbound Pine Avenue will close to all traffic. Access to the south side of the track will be provided at the intersection of Ocean Blvd. and Alamitos Avenue and will only be available to Grand Prix passholders and boat owner permits. Close interior streets of The Pike, north of Shoreline Drive. 7:00 PM Pine Avenue will be opened for traffic to access the Hyatt, Shoreline Village, and Shoreline Marina tenants. Valet Parking will be available for guests dining at waterfront restaurants. Shoreline Village has parking available as well. All vehicles entering at Pine Avenue will exit to the east through the Marina Green parking lot, please follow the directional signage. 9:30 PM The Ocean Blvd. and Alamitos Avenue entry access route will close. 7:00 PM Pine Avenue will be opened for traffic to access the Hyatt, Shoreline Village, and Shoreline Marina tenants. The Ocean Blvd. and Alamitos Avenue entry access route will close. Valet Parking will be available for guests dining at waterfront restaurants. Shoreline Village has parking available as well. All vehicles entering at Pine Avenue will exit to the east through the Marina Green parking lot, please follow the directional signage. 5:00 PM Traffic flow will be restored to both east and west bound Shoreline Drive; northbound Queensway Bridge off ramp, southbound Queensway Bridge on ramp from Shoreline Drive, east and west bound Seaside Way; north and south bound Pine Avenue, including Pine Avenue Circle; north and south bound Shoreline Village Drive; and all service roads and internal streets of The Pike facility.